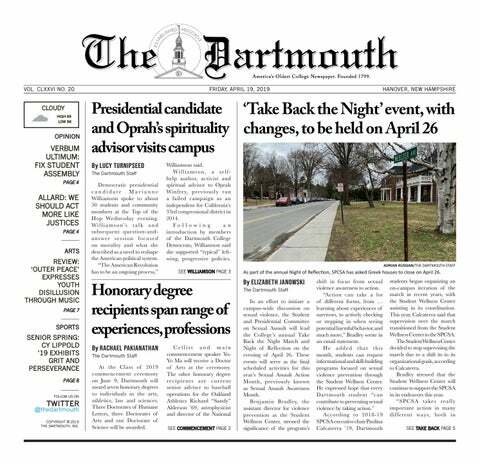 For the third year in a row, The Dartmouth conducted a survey that recorded the opinions and experiences of Dartmouth’s graduating seniors. Issues of political discourse at universities have increasingly transcended U.S. college campuses and attracted national attention. From Sunday, Sept. 24 to Thursday, Sept. 28, The Dartmouth fielded an online survey of Dartmouth undergraduates on their opinions of different aspects of the College. For the second year in a row, The Dartmouth conducted a survey on the beliefs and experiences of Dartmouth’s graduating class. With intense political discourse persisting well beyond this past election, The Dartmouth set out to examine the contours of Dartmouth student public opinion regarding current events. In late January, The Dartmouth conducted a survey about attitudes toward and experiences in various communities at Dartmouth. With the presidential election just one week away, a recent survey conducted by The Dartmouth found that students overwhelmingly support Democratic nominee Hillary Clinton.